Sacred choral music by Brazil’s most famous composer, Heitor Villa-Lobos, performed by one of Hyperion’s best-loved recording groups. These works were written as part of Villa-Lobos’s grand plan to revitalize music education in his native country. The human voice, an instrument acquired free of charge by every person in the nation, was seen by Villa-Lobos as the principal performing medium, particularly in massed choral form. Canto orfeônico (choral singing) became the order of the day. Among the performances Villa-Lobos directed was the Brazilian premiere of Palestrina’s Missa Papae Marcelli. This led to him to write his own a cappella Mass, Missa São Sebastião, St Sebastian being the patron saint of Rio de Janeiro, the major work on this album. In fact the Missa São Sebastião had not been a sudden isolated instance of sacred composition from Villa-Lobos. From his earliest years as a serious composer he had written many motets. The Corydon Singers perform a rich selection of these. St Cecilia! Divine Protector of Music. You have given to Brazil the privilege of love for music; you, who have brought together the birds, the rivers, the waterfalls, the seas, the winds, and the peoples of this land in an incomparable symphony, whose melodies and harmonies have contributed to the formation of the Brazilian soul and sense of goodwill, spiritually aiding the collective discipline of youth and of men to undertake the useful and essential functions of human society, enlighten those who confuse popular native manifestations, good but uncultured, with the expression of cultivated art. Gladden those who imagine that one day music will be the ‘Sonorous Flag of Universal Peace’. Guide Youth through the Art of Sound. And so through to a passionate plea for the good Saint to hear the ‘ardent prayers, full of Soul and Faith, of the musical artists of Brazil’. Nine years earlier, upon his return as a successfully established composer from a period of residence in Paris, Villa-Lobos found the state of national music-making in his own country dismal in the extreme. Musical life, one eminent Brazilian musicologist observed, was at the thermometer point of zero. Journeying to São Paulo in July 1930, with memories of Paris still fresh (a city where ‘early music’ pioneers such as Landowska and Boulanger rubbed shoulders with Milhaud and Varèse), Villa-Lobos was shocked by the mediocrity that he saw in public music around him, particularly in the cinema (where music was still performed ‘live’) and in education. The energetic Villa-Lobos immediately formulated a plan for the renovation of musical education, but the administration promising to activtate it was overthrown in the dramatic coup of 1930 which brought Getúlio Vargas to power. The setback was temporary, for the new government soon realized that Villa-Lobos’s plan, together with his dynamic personality and his skills as a composer and conductor, could be used for its own ends. Villa-Lobos, in 1932, received an official position, a salary, and a brief to renew musical education in Rio de Janeiro (and selectively elsewhere) in tandem with the highly charged and bureaucratic nationalistic fervour of the day. Complicated music courses were designed and implemented; text books and guides were issued; public ‘educational concerts’ were given by a specially formed orchestra under Villa-Lobos. Folk song and the exaltation of Brazil’s natural beauty were harnessed both musically and politically. Music was everywhere in the air. The human voice, an instrument acquired free of charge by every person in the nation, was seen by Villa-Lobos as the principal performing medium, particularly in massed choral form. Canto orfeônico (choral singing) became the order of the day. Every school child was taught to sing (patriotic songs, of course), and during the 1930s and early 1940s in Rio de Janeiro important civic and national holidays (7 September—Independence Day, for example) were marked for thousands of children by being herded into the city’s football stadia to sing, en masse, hymns of praise to Brazil and its government. The sentiments of the St Cecilia prayer were realized live under the blazing heat of a tropical sun, before President Vargas (who disliked music) directed by the charismatic baton of Villa-Lobos himself. When Villa-Lobos realized the potential of choral singing in his education programme he formed, in 1932, a special choir from the music staff of the city’s schools: the Orfeão de Professores. It was the task of this choir to ‘raise Brazilian artistic standards’ and to ‘support the official moves to use serious music as an educational medium’. Its repertoire ranged from arrangements by Villa-Lobos of Bach Preludes and Fugues to Brazilian folk melodies in choral settings. The ambience was already potent for the creation of the now-famous Bachianas brasileiras, Villa-Lobos’s personal fusion of ‘Bach’ with ‘Brazil’, and it is noteworthy that the period of Vargas’s various administrations (1930–1945) coincides exactly with that of the composition of those nine works. In April 1933 the Orfeão joined forces with the Orquestra Villa-Lobos to give the Brazilian premiere of Beethoven’s Missa solemnis. A few days later the choir gave the first Brazilian performance of Palestrina’s Missa Papae Marcelli at Rio’s exquisite Candelária Church as part of the celebrations marking Holy Week. The Mass was the centrepiece of a recital which included an Amerindian folk song, a Gregorian chant (‘text attr. Jesus Christ’), Bach, and Verdi. Such was the unordered eclecticism of Villa-Lobos that he saw no objection to garnering all these disparate elements as viable vehicles for praise to a trinity comprising God, Government, and Nation. Just weeks after that concert a now-faded photograph of the Orfeão was taken: ranks of timelessly smiling women in the hats and pencil-thin dresses of the day surround Villa-Lobos’s soon-to-be-estranged wife Lucília, who sits at the centre with a huge bouquet of flowers. On her right sits Dona Noêmia Villa-Lobos, his mother. The Orfeão was not only a manifestation of nationalism, but also an intensely personal project for Villa-Lobos. Its creation and functioning reflect a precise moment in both Brazilian history and Villa-Lobos’s own life. Villa-Lobos spent the last months of 1936 researching Amerindian and early Hispanic music, in preparation for composing the incidental score for a feature film, The Discovery of Brazil. This was one of many motion pictures made by government institutions at the time, glorifying the cultural and historic heritage of Brazil. This particular film told in just one hour of the Portuguese expedition under Cabral in 1500, the discovery of a beautiful new land, and of the first contact with the natives. Villa-Lobos went to considerable trouble with musical authenticity (as far as the erratic state of Brazilian musicology at the time would allow him), constructing his own melodies in similar vein to the chants of Brazilian indians, and imitating ancient Portuguese and Spanish secular and ecclesiastical music. The film’s musical and visual climax was the ‘First Mass in Brazil’, an impressive tableau in which the Portuguese sailors and crew cleverly sing Mass against the frighteningly juxtaposed incantations of the newly found Amerindians: a true clash and coming together of cultures, emphasizing the multi-racial traits which characterize Brazil even today, and which the Vargas government took great pains to harness as a symbolic means of national unity. Villa-Lobos’s ‘discovery’ of Papae Marcelli, and the evocation of a sixteenth-century Mass in a new, Brazilian context in this film score prompted him almost simultaneously to write his own a cappella Mass between December 1936 and January 1937, specifically for the Orfeão de Professores. It was entitled Missa São Sebastião, St Sebastian being the patron saint of Rio de Janeiro. An augmented Orfeão de Professores gave the first performance at Rio’s Teatro Municipal on 13 November 1937, in a grand concert held to mark the close of the secondary school academic year. Amongst Villa-Lobos’s papers there exists a manuscript of several recitative fragments headed ‘Introits da missa São Sebastião’. It is not quite clear how these were intended to be used, and they are omitted in the present recording, but their texts provide important subtitles for each section of the Mass. Just as movements in the Bachianas brasileiras mostly take dual titles, one ‘Bachian’, the other ‘Brazilian’, so the Mass movements are given patriotic identities in addition to their liturgical ones: ‘Kyrie—Sebastian! The Virtuous’, ‘Gloria—Sebastian! The Roman Soldier’, ‘Credo—Sebastian! Defender of the Church’, ‘Sanctus—Sebastian! The Martyr’, ‘Benedictus—Sebastian! The Saint’, ‘Agnus Dei—Sebastian! Protector of Brazil’. The Mass is composed for three voices a cappella, but Villa-Lobos gives a seasoned and practical musician’s variety of performing options: women’s voices, boys’ voices, or men’s voices, with each possibly doubled at the octave. In the Corydon Singers’ performance the first option is chosen. The self-consciously archaic three-part polyphony (which emulates Palestrina and Victoria), the modal inflexions of the vocal lines, and the austere simplicity of the whole work stand in stark contrast to the opulent style usually thought typical of Villa-Lobos, as demonstrated in the huge orchestral and choral frescos of jungle and city life, the Choros, which he wrote during the 1920s. In the Mass, raw nationalism gives way to an idealized and serene view of the powerful Catholic heritage of his country. Subtle glances at the chants of macumba (as at ‘et sepultus est’ in the Credo) are, however, reminders that in Brazil even the rites of Roman Catholicism have been (and still are) tinged with elements from the magical beliefs transported to Brazil by the millions of black slaves brought over the Atlantic by the colonists so many centuries ago. With Portuguese respectability came also African magic, and as food offerings to the old African gods of macumba and other cults are left alongside statuettes of St Mary and St George in Brazilian roadside shrines or in rocky clefts on the beach, so St Cecilia and St Sebastian embrace the whole of Villa-Lobos’s vision of multi-cultural Brazil, in the form of oration and liturgy. The Missa São Sebastião stands unique and radiantly beautiful in Villa-Lobos’s huge output. Villa-Lobos’s education programme required the production of large numbers of choral anthologies containing material suitable for performance in schools, concerts, civic events, worship, and for vocal rehearsal. The composer’s own administrative department (the ‘Superintendência de Educação Musical e Artistica’) issued these volumes under its own imprint, and the music was engraved mainly by students on the publishing and engraving course at the conservatory which Villa-Lobos had founded in 1942. The range of anthologies included: Canto orfeônico (two volumes of patriotic hymns, songs, and anthems, 1940, 1950); Guia prático (folk-song settings, 1932); Solfejos (vocalise and exercises, two volumes, 1938, 1945); Música sacra (motets and religious pieces, 1952). The Missa São Sebastião had not been a sudden isolated instance of sacred composition from Villa-Lobos. From his earliest years as a serious composer he had written many motets, and in 1919 came a full-scale Mass with orchestra entitled Vidapura (‘Pure Life’). This music all tended towards a heady, post-romantic language. Música sacra, the final volume in the choral anthology series, collected together further sacred pieces, written between the years 1937 and 1952 and which on the whole concentrate on the same clean polyphonic style established in the Missa São Sebastião. All the items are a cappella, though voice division in much of the music results in rich textures not found in the Mass. 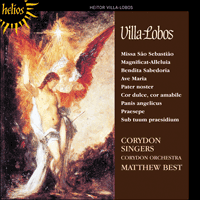 The Corydon Singers’ selection includes a four-part Pater noster written in 1950; an Avé Maria in five parts from 1938 (in Portuguese), and a second setting (in Latin) in six parts, written in 1948 while hospitalized in New York; a four-part Sub tuum praesidium (1952); Praesepe (1952), in which a mezzo solo chants verses from the poem ‘Beata Virgine’ (1563) by Padre José de Achieta, against the wordless vocalise of the choir; a four-part Panis angelicus (1950); and Cor dulce, cor amabile (1952). After the removal from office of Vargas in 1945, and the ending of the War (in which Brazil had taken part on the Allied side), Villa-Lobos began to travel extensively once more as a conductor of his own music, spending large portions of each year in Europe and the USA. Consequently his activities in Brazil as choral conductor, composer and educationalist diminished considerably. The requirement for patriotic choral works in any case ceased, and Villa-Lobos turned his compositional energies to operas and orchestral music. At the end of his life, however, two commissions resulted in further sacred choral works, and in these Villa-Lobos literally bid farewell to the world. A request from Pope Pius XII himself, via the Italian Association of St Cecilia, to celebrate ‘Lourdes Year’, resulted in a fine Magnificat-Alleluia for mezzo-soprano (or contralto), chorus, and orchestra, which was first performed at the Teatro Municipal, Rio de Janeiro, on 8 November 1958, conducted by Edoardo di Guarnieri. A further performance was given the following September. The terminally ill composer, recently discharged from hospital, attended, and was visibly moved by his own music. The audience gave him a spontaneous and generous ovation, and he waved feebly from his seat. This was the last concert he ever attended, and weeks later he was dead. Magnificat-Alleluia alternates the text of the Magnificat (contralto solo) with blocks of ‘Alleluia’, sung by the whole chorus. The intricate polyphony of São Sebastião or of the huge choral tour de force Bachianas brasileiras No 9, is eschewed. The choral writing of the ‘Alleluias’ is Gabrieli-like in its resounding antiphonies from voice to voice, and in its melismatic cadences; melismatic or chant-like too is the setting of the Magnificat text. Singer and chorus eventually unite in a surging, climactic ‘Amen’. A few weeks after the first performance in Rio de Janeiro of Magnificat-Alleluia, the College Chorus of New York University under Maurice Paress gave the premiere of Villa-Lobos’s very last a cappella choral work, Bendita Sabedoria (‘Blessed Wisdom’), which was dedicated to the University and written at the suggestion of Carleton Sprague Smith. Villa-Lobos, traveller in sound across the Brazilian landscape and great teller of myths and tales, finally confronts God in six chorales which set short Latin texts of Biblical wisdom. The music is spare, ritualistic, and static, and the simplicity of the Missa São Sebastião is recalled in gentle triadic harmonies; the arching, carefully controlled vocal lines highlight and reveal rather than obscure or decorate the eternal truths of the imposing Latin dictums. Wisdom, peace, and an acceptance of the life hereafter were eventually achieved by Villa-Lobos at an altar far removed from the festivities of his Brazilian Indians, or the edifices of his Choros compositions. Like his final String Quartet (No 17) of 1957, the textual economy of Bendita Sabedoria is astonishing, and the piece closes Villa-Lobos’s vast choral output with music of touching simplicity and grace. Sainte Cécile! Divine protectrice de la Musique. Tu as accordé au Brésil le privilège d’aimer la musique; Toi, qui as réuni les oiseaux, les rivières, les cascades, les mers, les vents, et tous les habitants de ce pays dans une symphonie incomparable, dont les mélodies et les harmonies ont contribué à la formation de l’âme brésilienne et son sens du bon vouloir, aidant spirituellement la discipline collective des jeunes et des adultes à entreprendre les fonctions essentielles et utiles d’une société humaine, éclaire ceux qui confondent les manifestations indigènes populaires, bonnes certes mais sans culture, avec l’expression de l’art et de la culture. Rends l’espoir à ceux qui pensent qu’un jour la musique sera «l’étendard sonore de la Paix Universelle». Guide la Jeunesse à travers l’Art des Sons. Et la prière continue dans cette veine jusqu’à une invocation passionnée à la Sainte d’entendre les «prières ardentes des musiciens du Brésil, expressions de leur âme et de leur foi». Neuf ans auparavant, Villa-Lobos, compositeur dont la réputation n’était plus à faire, avait trouvé à son retour d’un long séjour à Paris, la musique nationale de son pays dans un triste état. Selon les observations d’un éminent musicologue brésilien, la musique brésilienne était réduite à zéro. Durant son voyage de retour à São Paulo, en juillet 1930, quand ses souvenirs de Paris (où des promoteurs de la «musique ancienne» comme Landowska et Boulanger côtoyaient Milhaud et Varèse) étaient encore tout frais dans sa mémoire, Villa-Lobos fut choqué par la médiocrité de la musique populaire qu’il entendait partout autour de lui, particulièrement dans les cinémas (où la musique était encore jouée «en direct») et dans l’enseignement. Villa-Lobos était un homme d’action; il élabora immédiatement un projet de rénovation de l’éducation musicale, mais le gouvernement qui promit de le mettre à exécution fut renversé dans le coup d’état dramatique de 1930 qui donna le pouvoir à Getúlio Vargas. Ce ne fut qu’un revers temporaire, car le nouveau gouvernement comprit rapidement qu’il pouvait utiliser à ses propres fins le projet de Villa-Lobos ainsi que sa personnalité dynamique et ses talents de compositeur et de chef d’orchestre. Villa-Lobos reçut, en 1932, un poste officiel, un salaire et la mission de renouveler l’éducation musicale à Rio de Janeiro (et de façon sélective, ailleurs) en travaillant de pair avec l’intense et bureaucratique ferveur nationaliste de l’époque. De complexes programmes musicaux furent créés et mis en œuvre; des manuels et des guides publiés; des «concerts éducatifs» publics furent donnés par un orchestre formé spécialement sous la direction de Villa-Lobos. Les chants populaires et l’exaltation de la beauté naturelle du Brésil furent exploités à la fois du point de vue musical et du point de vue politique. La musique était reine. Villa-Lobos considérait la voix humaine, instrument que tout Brésilien possédait sans qu’il n’en coûta rien, comme le principal instrument d’interprétation de la musique, surtout sous la forme d’énormes chœurs. Canto orfeônico (chant choral) devint la règle de l’époque. Tous les écoliers apprenaient à chanter (des chants patriotiques, bien entendu) et pendant les années 30 et au début des années 40, les jours fériés civiques et nationaux (le 7 septembre—Fête de l’Indépendance, par exemple) étaient célébrés par le rassemblement de milliers d’enfants dans les stades de football de Rio de Janeiro pour chanter en masse, des hymnes à la louange du Brésil et de son gouvernement. Les sentiments qu’exprimait la prière à Sainte Cécile étaient réalisés en direct sous la chaleur brûlante du soleil tropical, devant le Président Vargas (qui n’aimait pas la musique) sous le charismatique bâton de Villa-Lobos. Quand le compositeur se rendit compte du potentiel du chant choral dans son programme éducatif, il forma, en 1932, un chœur spécial avec les professeurs de musique des écoles de la ville: l’Orfeão de Professores. La tâche de ce chœur était de «rehausser les standards artistiques brésiliens» et «d’offrir son soutien aux mesures officielles pour l’utilisation de musique sérieuse comme agent éducatif». Le répertoire de cet orphéon allait d’arrangements par Villa-Lobos des Préludes et Fugues de Bach à des arrangements choraux de mélodies populaires brésiliennes. C’était déjà une ambiance potentielle pour la création des Bachianas brasileiras maintenant célèbres, la fusion personnelle par Villa-Lobos de «Bach» avec «Brésil»; il faut remarquer que la période des différents gouvernements de Vargas (1930–1945) coïncide exactement avec celle de la composition de ces neuf ouvrages. En avril 1933, l’Orfeão se joignit à l’Orquestra Villa-Lobos pour donner la première audition brésilienne de la Missa solemnis de Beethoven. Quelques jours plus tard le chœur donna la première représentation au Brésil de la Missa Papae Marcelli de Palestrina, dans l’exquise église Candelária à Rio—c’était sa participation aux fêtes de la Semaine Sainte. La messe était l’ouvrage maîtresse d’un récital qui comprenait un chant populaire amérindien, un chant grégorien (texte attribué à Jésus-Christ), Bach et Verdi. L’éclectisme anarchique de Villa-Lobos était tel qu’il ne voyait aucune difficulté à réunir tous ces éléments disparates comme des véhicules aptes à chanter les louanges d’une trinité comprenant Dieu, le Gouvernement et la Nation. Une photographie, maintenant pâlie, de l’Orfeão prise quelques semaines après ce concert nous révèle des rangs de femmes aux sourires immuables, portant les chapeaux et robes étroites de l’époque, entourant Lucília, l’épouse de Villa-Lobos—dont il allait bientôt se séparer—assise au centre avec un énorme bouquet de fleurs. À sa droite est assise Dona Noêmia Villa-Lobos, sa mère. L’Orfeão n’était pas seulement une manifestation de nationalisme, mais aussi un projet intensément personnel de Villa-Lobos. Sa création et son fonctionnement reflètent un moment précis à la fois dans l’histoire brésilienne et dans la vie de Villa-Lobos. Villa-Lobos passa les derniers mois de 1936 à faire des recherches sur la musique amérindienne et la musique ibérique primitive; il se préparait à composer la musique du film La Découverte du Brésil. C’était un des nombreux films tournés par les institutions gouvernementales de l’époque, à la gloire de l’héritage historique et culturel du Brésil. Celui-ci ne prenait qu’une heure pour relater l’expédition portugaise qu’avait dirigée Cabral en 1500, la découverte d’un magnifique nouveau territoire, et le premier contact avec les indigènes. Villa-Lobos se donna beaucoup de peine pour préserver une authenticité musicale (autant que l’état erratique de la musicologie brésilienne de l’époque le lui permettait); la construction de ses mélodies est dans le même esprit que celle des chants des indiens brésiliens, et il imite la musique profane et religieuse de l’ancienne musique portugaise et espagnole. L’apogée musicale et visuelle du film était «La Première messe au Brésil», tableau émouvant dans lequel Villa-Lobos fait, de main de maître, chanter la messe aux marins et à l’équipage portugais sur un fond d’incantations—juxtaposition effrayante—des amérindiens tout nouvellement découverts: un vrai heurt et rapprochement de cultures, mettant l’emphase sur les traits multi-raciaux qui caractérisent encore de nos jours le Brésil, et que le gouvernement de Vargas mettait grands soins à exploiter comme un moyen symbolique d’unité nationale. La «découverte» par Villa-Lobos de Papae Marcelli, et l’évocation d’une messe du seizième siècle dans un nouveau contexte brésilien, dans la musique de ce film, incita le compositeur à écrire presque simultanément sa propre messe a cappella entre décembre 1936 et janvier 1937; il l’écrivit spécifiquement pour l’Orfeão de Professores. Il l’appela Missa São Sebastião, Saint Sébastien étant le saint patron de Rio de Janeiro. Un Orfeão de Professores à effectifs augmentés la créa au Teatro Municipal de Rio, le 13 novembre 1937, dans un grand concert qui célébrait la fin de l’année scolaire des écoles secondaires. Il existe parmi les papiers de Villa-Lobos un manuscrit de plusieurs fragments récitatifs sous le titre de «Introits da missa São Sebastião». La façon dont ils devraient être utilisés n’est pas très claire, et ils sont omis dans l’enregistrement présent, mais leur texte fournit d’importants sous-titres pour chaque section de la messe. Tout comme les mouvements des Bachianas brasileiras qui ont presque tous deux titres, l’un «inspiré de Bach», l’autre «brésilien», les mouvements de la messe reçoivent de même des identités patriotiques en plus de leurs titres liturgiques: «Kyrie—Sébastien! Le Vertueux», «Gloria—Sébastien! Le Soldat romain», «Credo—Sébastien! Défenseur de l’Église», «Sanctus—Sébastien! Le Martyr», «Benedictus—Sébastien! Le Saint», «Agnus Dei—Sébastien! Protecteur du Brésil». La messe est composée pour trois voix a cappella, mais Villa-Lobos, en musicien expérimenté et pratique, offre une variété d’options d’exécution: voix de femmes, voix de jeunes garçons, ou voix d’hommes, avec la possibilité pour chacune d’être doublée à l’octave. Les Corydon Singers ont choisi la première option. La polyphonie à trois parties, gauchement archaïque (qui émule Palestrina et Victoria), les inflexions modales des lignes vocales, et l’austère simplicité de l’œuvre toute entière forment un contraste absolu avec le style opulent que l’on associe d’habitude avec Villa-Lobos, tel que les énormes fresques chorales et orchestrales de vie dans la jungle et dans la ville, les Choros, qu’il composa durant les années 1920. Dans la messe, un nationalisme brut cède la place à une vue sereine et idéalisée du puissant héritage catholique de son pays. De subtiles allusions aux mélopées de macumba (comme à «et sepultus est» dans le Credo), servent à rappeler qu’au Brésil, même les rites du catholicisme romain ont été colorés (et le sont encore) par des éléments provenant des croyances magiques que les millions d’esclaves noirs, transportés à travers l’Atlantique par les colons, apportèrent au Brésil, il y a tant de siècles. Avec la respectabilité portugaise vint aussi la magie africaine, et tout comme des offrandes de nourriture aux anciens dieux africains de macumba et autres cultes sont déposées côte à côte des statuettes de Sainte Marie et Saint Georges, dans les petites chapelles au bord des routes ou dans les fissures de rochers sur la plage, Sainte Cécile et Saint Sébastien englobent, de la même façon, la totalité de la vision qu’avait Villa-Lobos du Brésil multiculturel, sous la forme d’oraison et de liturgie. La Missa São Sebastião est d’une radieuse beauté et unique dans l’énorme production de Villa-Lobos. Le programme d’éducation de Villa-Lobos exigeait la production d’un grand nombre d’anthologies chorales contenant le matériel qui convenait aux écoles, concerts, manifestations civiques, culte, et pour les répétitions vocales. Tous ces volumes étaient édités par le service administratif du compositeur (la «Superintendência de Educação Musical e Artistica»), et la musique en était imprimée principalement par les étudiants des cours d’édition et d’impression de musique du conservatoire que Villa-Lobos avait fondé en 1942. La gamme des anthologies comprenait Canto orfeônico (deux volumes d’hymnes patriotiques, chansons et antiennes, 1940, 1950); Guia prático (arrangements de chants populaires, 1932); Solfejos (vocalises et exercices, deux volumes, 1938, 1945); Música sacra (motets et ouvrages religieux, 1952). La Missa São Sebastião n’avait pas été un cas isolé et inattendu de composition sacrée de la part de Villa-Lobos. Dès ses premières années de composition sérieuse, il avait écrit de nombreux motets, et, en 1919, il composa une messe intégrale avec orchestre sous le titre Vidapura («Vie pure»). Toute cette musique inclinait vers un langage impétueux, post-romantique. Música sacra, qui est le dernier volume de la série d’anthologie chorale, rassemble d’autres ouvrages de musique sacrée, écrits entre 1937 et 1952, qui se concentrent généralement sur le même style polyphonique pur que l’on trouve dans la Missa São Sebastião. Tous les ouvrages sont a cappella, bien que de riches textures que l’on ne trouve pas dans la messe soient obtenues par la division des voix. La sélection des Corydon Singers comprend un Pater noster à quatre parties, écrit en 1950; un Avé Maria à cinq parties de 1938 (en portugais), et un second arrangement (en latin) à six parties, écrit en 1948, pendant l’hospitalisation du compositeur à New York; un Sub tuum praesidium à quatre parties (1952); Praesepe (1952), dans lequel un contralto solo psalmodie des strophes du poème «Beata Virgine» (1563) du Père José de Achieta, sur un fond de vocalises sans paroles par le chœur; un Panis angelicus à quatre parties (1950); et Cor dulce, cor amabile (1952). Après que Vargas ait perdu le pouvoir en 1945, et à la fin de la guerre (à laquelle le Brésil avait participé du côté des Alliés), Villa-Lobos recommença à beaucoup voyager, dirigeant sa propre musique, et passa chaque année beaucoup de temps en Europe et aux États-Unis. Ses activités de directeur de chorales, de compositeur et d’éducateur diminuèrent donc considérablement. De toute façon, la demande d’ouvrages choraux patriotiques avait cessé et Villa-Lobos concentra son énergie sur la composition d’opéras et de musique d’orchestre. À la fin de sa vie, néanmoins, deux commandes lui firent composer d’autres œuvres chorales sacrées; et c’est avec elles que Villa-Lobos fit littéralement ses adieux au monde. C’est à la suite d’une commande du Pape Pie XII lui-même, par la voie de l’Association italienne de Sainte Cécile, pour célébrer «l’Année de Lourdes», que fut composé le très beau Magnificat-Alleluia pour mezzo-soprano (ou contralto), chœur, et orchestre, créé au Teatro Municipal, Rio de Janeiro, le 8 novembre 1958, sous la direction de Edoardo di Guarnieri. Une autre représentation eut lieu en septembre de l’année suivante. Le compositeur qui, dans la phase terminale de la maladie qui allait l’emporter, avait récemment quitté l’hôpital, y assistait et fut manifestement ému par sa musique. Les spectateurs lui firent spontanément une généreuse ovation, et il répondit faiblement sans pouvoir se lever. Ce fut le dernier concert auquel il assista et il mourut quelques semaines plus tard. Dans le Magnificat-Alleluia, le texte du Magnificat (contralto solo) alterne avec des blocs de l’«Alleluia» chantés par le chœur tout entier. La polyphonie complexe de São Sebastião ou de l’énorme tour de force choral Bachianas brasileiras nº 9, est évitée. L’écriture chorale de l’«Alleluia» ressemble à celle de Gabrieli avec ses antiennes résonnant de voix à voix, et ses cadences mélismatiques; l’arrangement du texte du Magnificat aussi est mélismatique ou psalmodique. Le chanteur et le chœur s’unissent finalement dans un «Amen» qui jaillit dans une intensité sonore vers son apogée. Quelques semaines après la création du Magnificat-Alleluia, à Rio de Janeiro, la Chorale de l’Université de New York, sous la direction de Maurice Paress, créa la toute dernière œuvre chorale a cappella de Villa-Lobos, Bendita Sabedoria («Sagesse bénite»), qui était dédiée à l’Université et écrite à la suggestion de Carleton Sprague Smith. Villa-Lobos, voyageur par les sons à travers le paysage brésilien et grand raconteur de mythes et de contes, confronte finalement Dieu dans six chorales qui mettent en musique de courts textes latins de sagesse biblique. La musique est sobre, ritualiste et statique, et les douces harmonies d’accords parfaits rappellent la simplicité de la Missa São Sebastião; les lignes vocales archées, soigneusement contrôlées soulignent et révèlent plutôt qu’obscurent ou ornent les vérités éternelles des imposantes maximes latines. Villa-Lobos parvint à la sagesse, la paix, et à une acceptation de la vie au-delà de la tombe sur un autel bien éloigné des festivités de ses indiens brésiliens, ou des édifices de ses compositions des Choros. Comme son dernier quatuor à cordes (nº 17) de 1957, l’économie textuelle de Bendita Sabedoria est surprenante, et c’est avec une musique de grâce et simplicité touchantes que cet ouvrage met fin à la vaste production chorale de Villa-Lobos. Heilige Cäcilia! Göttliche Schutzherrin der Musik. Du hast Brasilien mit Liebe zur Musik gesegnet; du, die du die Vögel, die Flüsse, die Wasserfälle, die Meere, die Winde und die Völker dieses Landes zu einer unvergleichlichen Sinfonie zusammengeführt hast, deren Melodien und Harmonien die brasilianische Seele und Verständigungsbereitschaft mit geformt hat, um geistig die gemeinschaftliche Disziplin der Jugend und der Erwachsenen so zu befördern, daß sie nützliche und unerläßliche gesellschaftliche Aufgaben in Angriff nehmen. Erleuchte du jene, die gutgemeinte aber unkultivierte volkstümliche Ausdrucksformen mit der Pflege anspruchsvoller Kunst verwechseln. Erfreue jene, die davon träumen, daß Musik eines Tages das „klingende Banner des Weltfriedens“ sein werde. Führe die Jugend an die Kunst der Klänge heran. Und so weiter, bis hin zu der inbrünstigen Bitte, die gute Heilige möge die „glutvollen, aus tiefster Seele und tiefstem Glauben entspringenden Gebete der Musikschaffenden Brasiliens“ erhören. Neun Jahre zuvor war Villa-Lobos als erfolgreicher, etablierter Komponist von einem mehrjährigen Parisaufenthalt zurückgekehrt und hatte die Pflege der Musik in seinem Heimatland im Zustand äußerster Vernachlässigung vorgefunden. Das Musikleben war, so ein bekannter brasilianischer Musikwissenschaftler, auf dem Nullpunkt angekommen. Als Villa-Lobos im Juli 1930 nach São Paulo reiste—die Erinnerung an Paris (die Stadt, in der Vorkämpfer „Alter Musik“ wie Wanda Landowska und Nadia Boulanger ebenso tätig waren wie Milhaud und Varèse) noch frisch im Gedächtnis—war er schockiert von der Mittelmäßigkeit des öffentlichen Musizierens, insbesondere an den Schulen und im Kino (wo noch „live“ gespielt wurde). Der energische Villa-Lobos formulierte sofort einen Plan zur Erneuerung der Musikerziehung, doch die Regierung, die ihn in die Tat umzusetzen versprach, wurde bei dem dramatischen Staatsstreich von 1930 gestürzt, der Getúlio Vargas an die Macht brachte. Dieser Rückschlag war jedoch nicht von Dauer, denn das neue Regime erkannte bald, daß Villa-Lobos’ Plan, im Verein mit seiner dynamischen Persönlichkeit und seinem Können als Komponist und Dirigent, für seine eigenen Ziele einsetzbar war. 1932 erhielt Villa-Lobos eine offizielle Stellung, ein Salär und den Auftrag, die Musikerziehung in Rio de Janeiro (und an ausgewählten anderen Orten) zu erneuern, und zwar im Einklang mit dem bürokratisch gesteuerten und angeheizten Nationalbewußtsein. Komplizierte Musikkurse wurden entworfen und eingeführt; Lehrbücher und Leitfäden wurden herausgegeben; öffentliche „Bildungskonzerte“ wurden von einem eigens neugegründeten Orchester unter der Leitung von Villa-Lobos gegeben. Volkslieder und das Lob der Naturschönheiten Brasiliens wurden sowohl musikalisch als auch politisch ausgenutzt. Überall lag Musik in der Luft. Die menschliche Stimme, ein Instrument, das allen Landesbewohnern gratis zu Gebot stand, sah Villa-Lobos als Hauptträger musikalischer Darbietung, insbesondere in Form von Massenchören. Canto orfeônico (Chorsingen) wurde zur Forderung des Tages. Jedes Schulkind wurde zum Singen (natürlich von patriotischen Liedern) angehalten. Während der dreißiger und frühen vierziger Jahre wurden wichtige städtische und nationale Feiertage (zum Beispiel der Unabhängigkeitstag am 7. September) in Rio de Janeiro begangen, indem man Tausende von Kindern in die Fußballstadien der Stadt trieb, wo sie massiert Lobeshymnen auf Brasilien und seine Regierung zu singen hatten. Die Gesinnungsäußerungen des Cäciliengebets wurden in der Gluthitze der Tropensonne realisiert, in Anwesenheit von Präsident Vargas (der eine Abneigung gegen Musik hatte) und von Villa-Lobos selbst charismatisch geleitet. Als Villa-Lobos den Wert des Chorgesangs für sein Erziehungsprogramm erkannte, gründete er 1932 einen besonderen Chor, der sich aus dem musikalischen Lehrpersonal der städtischen Schulen zusammensetzte: das Orfeão de Professores. Aufgabe dieses Chors war es, „das künstlerische Niveau Brasiliens zu heben“ und „die offiziellen Bemühungen um die Nutzung ernster Musik als Erziehungsmittel zu unterstützen“. Sein Repertoire reichte von Villa-Lobos’ Arrangements von Bach-Präludien und Fugen bis hin zu Chorbearbeitungen brasilianischer Volksweisen. Das Umfeld war also bereits reif für die Entstehung der heute berühmten Bachianas brasileiras, Villa-Lobos’ persönlicher Kombination von „Bach“ und „Brasilien“. Es ist bemerkenswert, daß die Amtszeit von Vargas (1930–1945) genau mit der Entstehungszeit dieser neun Werke zusammenfällt. Im April 1933 tat sich das Orfeão mit dem Orquestra Villa-Lobos zusammen, um die brasilianische Erstaufführung von Beethovens Missa solemnis zu geben. Wenige Tage später besorgte der Chor im Zuge der Feiern zur Karwoche die erste Aufführung in Brasilien von Palestrinas Missa Papae Marcelli in der herrlichen Candelária-Kirche von Rio. Die Messe war Höhepunkt eines Konzertprogramms, das außerdem ein indianisches Volkslied, einen Gregorianischen Choral („Text: Jesus Christus zugeschrieben“) sowie Werke von Bach und Verdi umfaßte. Der ungezügelte Eklektizismus von Villa-Lobos ging soweit, daß er es durchaus angemessen fand, all diese widersprüchlichen Elemente zum Lobe der Dreifaltigkeit von Gott, Regime und Nation einzusetzen. Wenige Wochen nach dem erwähnten Konzert wurde ein heute verblaßtes Foto des Orfeão aufgenommen: reihenweise zeitlos lächelnde Frauen in den Hüten und schmal geschnittenen Kleidern jener Zeit, und in ihrer Mitte mit einem riesigen Blumenstrauß Villa-Lobos’ Frau Lucília, die sich bald darauf von ihm trennen sollte. Zu ihrer Rechten sitzt Dona Noêmia Villa-Lobos, seine Mutter. Das Orfeão war nicht nur Sinnbild des Nationalismus, sondern auch ein für Villa-Lobos persönlich wichtiges Projekt. Seine Gründung und sein Wirken spiegeln einen genau definierten Moment sowohl in der Geschichte Brasiliens als auch im Leben von Villa-Lobos wider. Villa-Lobos verbrachte die letzten Monate des Jahres 1936 damit, indianische und frühe hispanische Musik zu erforschen. Er bereitete sich damit auf die Komposition der Musik für den Film Die Entdeckung Brasiliens vor. Es handelt sich um einen von vielen Filmen, die damals von staatlichen Institutionen hergestellt wurden, um das kulturelle und historische Erbe Brasiliens zu verherrlichen. Dieser spezielle Film handelte in einer Stunde die portugiesische Expedition unter Cabral im Jahre 1500 ab, die Entdeckung eines wunderbaren neuen Landes und den ersten Kontakt mit den Eingeborenen. Villa-Lobos bemühte sich um musikalische Authentizität, soweit ihm das beim zweifelhaften Zustand der brasilianischen Musikwissenschaft damals möglich war. Er schuf eigene Melodien in Anlehnung an die Gesänge brasilianischer Indianer und ahmte alte Formen weltlicher und kirchlicher Musik aus Portugal und Spanien nach. Musikalischer und optischer Höhepunkt des Films war die „erste Messe in Brasilien“, ein eindrucksvolles Tableau, in dem die portugiesischen Seeleute und Mannschaften die Messe singen, geschickt abgesetzt gegen die erschreckend fremdartigen Gesangsrituale der neu entdeckten Indianer: ein wahres Aufeinandertreffen und Zusammenfinden der Kulturen, Hinweis auf die bis heute für die Bewohner Brasiliens charakteristische Völkervielfalt—das Vargas-Regime legte großen Wert darauf, sie als Symbol nationaler Einheit nutzbar zu machen. Villa-Lobos’ „Entdeckung“ der Missa Papae Marcelli und die filmische Darstellung einer Messe des 16. Jahrhunderts im neuen brasilianischen Kontext führten dazu, daß er beinahe zeitgleich, zwischen Dezember 1936 und Januar 1937, eine eigene A-cappella-Messe für das Orfeão de Professores schrieb. Sie trug den Titel Missa São Sebastião: Sankt Sebastian ist der Schutzheilige von Rio de Janeiro. Ein erweitertes Orfeão de Professores gab am 13. November 1937 bei einem Galakonzert zum Abschluß des Oberschuljahres die Erstaufführung im Teatro Municipal von Rio. Unter den Papieren von Villa-Lobos findet sich ein Manuskript mit mehreren Rezitativfragmenten unter dem Titel „Introits da missa São Sebastião“. Es ist nicht ganz klar, wozu sie bestimmt waren, und sie wurden für die vorliegende Aufnahme nicht verwendet, doch ihre Texte liefern wichtige Untertitel für die einzelnen Abschnitte der Messe. Ebenso wie die Sätze der Bachianas brasileiras meist doppelte Titel aufweisen—„bachisch“ der eine, der andere „brasilianisch“—werden auch die Messesätze zusätzlich zu den liturgischen Bezeichnungen mit patriotischen Etiketten versehen: „Kyrie Sebastian! Der Tugendhafte“, „Gloria—Sebastian! Der römische Soldat“, „Credo—Sebastian! Verteidiger der Kirche“, „Sanctus—Sebastian! Der Märtyrer“, „Benedictus—Sebastian! Der Heilige“ und „Agnus Dei—Sebastian! Der Schutzherr Brasiliens“. Die Messe ist dreistimmig a cappella gesetzt, doch bietet Villa-Lobos als erfahrener und praktisch denkender Musiker verschiedene Aufführungsmöglichkeiten an: Frauenstimmen, Knabenstimmen oder Männerstimmen, wobei jede Fassung oktavische Verdoppelung zuläßt. Für die Aufnahme der Corydon Singers wurde die erste Variante gewählt. Die bewußt archaische dreistimmige Polyphonie (in Anlehnung an Palestrina und Victoria), die modal geführten Gesangslinien und die strenge Schlichtheit des ganzen Werkes stehen in scharfem Gegensatz zu dem opulenten Stil, den man sonst mit Villa-Lobos verbindet. Der wird in den Choros aus den zwanziger Jahren anschaulich dargelegt, großangelegten Fresken von Dschungel- und Stadtleben für Chor und Orchester. In der Messe dagegen weicht grobschlächtiger Nationalismus einer idealisierten und klaren Betrachtung der mächtigen katholischen Tradition seines Landes. Subtile Hinweise auf die Gesänge des Macumba (zum Beispiel bei „et sepultus est“ im Credo) erinnern jedoch daran, daß in Brasilien sogar die Riten der römisch-katholischen Kirche mit Elementen magischen Naturglaubens versetzt wurden (und noch werden). Diese kamen mit den Million en schwarzer Sklaven über den Atlantik, die vor Jahrhunderten von den Kolonialherren ins Land gebracht wurden. Neben portugiesischer Ehrbarkeit kam afrikanische Magie, die sich unter anderem darin äußert, daß an Standbildern der Muttergottes und des heiligen Georg am Straßenrand oder in Felsspalten am Strand Nahrungsopfer für die afrikanischen Macumbagötter hinterlassen werden. In gleicher Weise sind die heilige Cäcilie und Sankt Sebastian für Villa-Lobos der Inbegriff eines multikulturellen Brasilien, was er in Ansprache und Liturgie zum Ausdruck bringt. Die Missa São Sebastião ragt einzigartig und strahlend schön aus dem umfangreichen Œuvre von Villa-Lobos heraus. Das Erziehungsprogramm von Villa-Lobos erforderte die Erstellung einer großen Zahl von Choranthologien mit Material, das sich zur Aufführung in Schulen und Konzertsälen, bei öffentlichen Feiern, im Gottesdienst und zur Stimmbildung eignete. Die Verwaltungsbehörde des Komponisten (die „Superintendência de Educação Musical e Artistica“) gab solche Bände in eigenem Namen heraus; den Notensatz besorgten hauptsächlich Studenten des Verlags- und Gravurkurses am 1942 von Villa-Lobos gegründeten Konservatorium. Unter anderem erschienen folgende Anthologien: Canto orfeônico (zwei Bände mit patriotischen Hymnen, Liedern und Chorälen, 1940 u. 1950), Guia prático (Volksliedvertonungen, 1932), Solfejos (Vokalisen und Übungsstücke, zwei Bände, 1938 u. 1945), Música sacra (Motetten und religiöse Stücke, 1952). Die Missa São Sebastião war kein unvermittelter und vereinzelter Fall eines Kirchenmusikwerks von Villa-Lobos. Schon ganz zu Anfang seiner Laufbahn als seriöser Komponist hatte er zahlreiche Motetten geschrieben, und 1919 folgte eine vollständige Messe mit Orchester unter dem Titel Vidapura („Reines Leben“). Diese Werke neigten insgesamt zu einer ungestümen postromantischen Ausdrucksweise. Música sacra, der letzte Band in der Reihe der Choranthologien, vereinte weitere Kirchenmusik aus den Jahren 1937 bis 1952, die weitgehend den klaren polyphonen Stil der Missa São Sebastião fortführt. Sämtliche Stücke sind a cappella angelegt, doch ergibt die Aufteilung der Stimmen bei der Mehrzahl dichte Strukturen, wie sie in der Messe nicht vorkommen. Die Auswahl der Corydon Singers umfaßt ein vierstimmiges Pater noster aus dem Jahr 1950, ein Avé Maria zu fünf Stimmen von 1938 (auf Portugiesisch) und eine weitere (lateinische) Vertonung zu sechs Stimmen, die 1948 entstand, als Villa-Lobos in New York im Krankenhaus lag. Hinzu kommen ein vierstimmiges Sub tuum praesidium (1952), Praesepe (1952), in dem ein Altsolo über die wortlosen Vokalisen des Chors Strophen aus dem Gedicht „Beata Virgine“ (1563) von Padre José de Achieta vorträgt, ein vierstimmiges Panis angelicus (1950) und Cor dulce, cor amabile (1952). Nach der Amtsenthebung von Vargas im Jahre 1945 und dem Ende des Weltkriegs (an dem Brasilien auf alliierter Seite teilgenommen hatte) unternahm Villa-Lobos erneut ausgedehnte Konzertreisen als Dirigent seiner eigenen Musik und verbrachte große Teile eines jeden Jahres in Europa und den USA. Dadurch verringerten sich seine Aktivitäten in Brasilien als Chorleiter, Komponist und Erzieher erheblich. Außerdem bestand ohnehin keine Nachfrage mehr nach patriotischen Chorwerken, und Villa-Lobos wandte sich dem Komponieren von Opern und Orchesterwerken zu. Gegen Ende seines Lebens sorgten jedoch Kompositionsaufträge für die Entstehung von zwei weiteren sakralen Chorwerken. Mit ihnen nahm Villa-Lobos im wahrsten Sinne Abschied von der Welt. Ein persönliches Ersuchen von Papst Pius XII., vermittelt durch die italienische Vereinigung der heiligen Cäcilia, brachte zur Feier des „Lourdes-Jahres“ ein gelungenes Magnificat-Alleluia für Mezzosopran (oder Alt), Chor und Orchester hervor, das am 8. November 1958 im Teatro Municipal von Rio de Janeiro unter der Leitung von Edoardo di Guarnieri uraufgeführt wurde. Eine zweite Aufführung im folgenden September schloß sich an. Der todkranke, soeben aus dem Krankenhaus entlassene Komponist wohnte dem Konzert bei und zeigte sich sichtbar gerührt von seiner eigenen Musik. Das Publikum bedachte ihn mit einer spontanen und tiefempfundenen Ovation, doch er konnte nur geschwächt von seinem Sitzplatz aus winken. Es war das letzte Konzert, das er erlebte, und er starb wenige Wochen später. Das Magnificat-Alleluia alterniert den Text des Magnificat (Altsolo) mit „Alleluia“-Passagen, die vom ganzen Chor gesungen werden. Die komplexe Polyphonie der Missa São Sebastião oder die Glanzleistung des gewaltigen Chorsatzes der Bachianas brasileiras Nr. 9 werden hier gemieden. Die Chorführung der „Alleluias“ erinnert mit ihren klingenden Antiphonien zwischen den Stimmen und den melismatischen Kadenzen an Gabrieli; auch die Vertonung des Magnificat-Textes ist melismatisch beziehungsweise choralähnlich. Am Schluß vereinen sich Solistin und Chor zu einem aufbrandenden, krönenden „Amen“. Wenige Wochen nach der Uraufführung des Magnificat-Alleluia in Rio de Janeiro gab der Chor der New York University unter Maurice Paress die Premiere von Villa-Lobos’ allerletztem A-cappella-Chorwerk, Bendita Sabedoria („Gesegnete Weisheit“), das der Universität gewidmet und auf Anregung von Carleton Sprague Smith entstanden war. Hier tritt Villa-Lobos, der Klangreisende durch die Landschaft Brasiliens, der große Erzähler von Mythen und Legenden, endlich vor Gott. Er tut dies in sechs Chorälen auf kurze lateinische Texte biblischer Weisheit. Die Musik ist karg, ritualistisch, statisch, und die sanften Dreiklangharmonien erinnern in ihrer Schlichtheit an die Missa São Sebastião. Die überwölbenden, sorgsam geführten Gesangslinien betonen und offenbaren die ewigen Wahrheiten der imposanten lateinischen Sprüche, statt sie zu verdunkeln oder auszuschmücken. Weisheit, Frieden und der Glaube an ein Leben im Jenseits wurden von Villa-Lobos schließlich an einem Altar erreicht, der weit entfernt ist von seinen brasilianischen Indianern oder den Konstrukten seiner Choros-Kompositionen. Wie bei seinem letzten Streichquartett (Nr. 17) von 1957 ist auch hier die Sparsamkeit der Linienführung verblüffend, und das Stück beschließt Villa-Lobos’ großes Œuvre an Chorwerken mit Musik von anrührender Schlichtheit und Grazie.